Teacher Appreciation Week is coming up this week (the first week of May). Get creative with these ideas from some of the most talented bloggers during my Teacher Appreciation Gift Ideas series! All April we will be featuring great ideas. I can’t wait to see what they share. You will be totally prepared with ideas to thank your teachers! 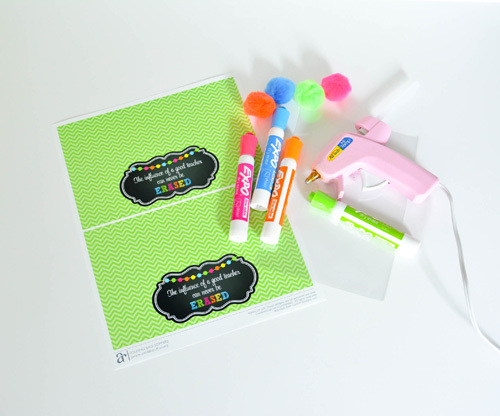 Make your teacher a perfect gift for summer with this Have a Totes Awesome Summer Printable Tag! Need a last minute gift? Give a gift card with these colorful teacher appreciation gift card holder. Maureen Anders of Anders Ruff here to share a FREE Printable Bag topper that is perfect for Teacher Appreciation Week! Adria (Ruff) loves this teacher quote that says “The influence of a good teacher can never be erased” and thought it would be perfect to incorporate either pencils or erasers. Instead, she went for a more colorful approach and went with dry erase markers! This is quote hits home for me because I have countless memories and inspiration from my youngest years as a student. 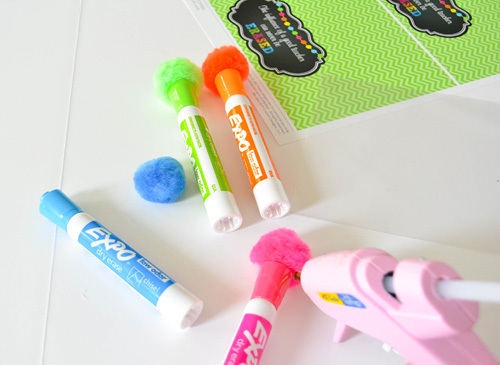 All teachers need Dry Erase Markers and of course there is no way to make them cuter than to add a by gluing on poms… it makes the markers festive, yet practical when used. 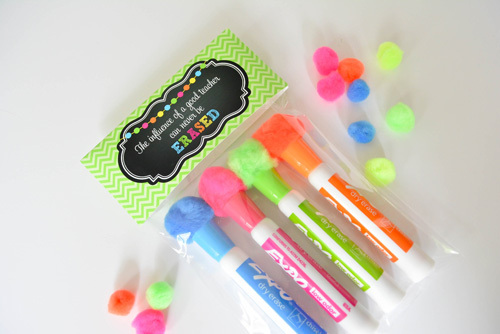 Wrap them up in a clear cello bag, add the Free Printable Bag Topper (which you can download from Anders Ruff) and you have the perfect Teacher Appreciation Gift! 1) Print the bag toppers and trim along the outside edges. Fold in half. 3) Fold the bag topper over the cellophane bag and staple shut or tape shut. These printable bag toppers could also be used to top of bags of pencil erasers, chalk markers, or even just chalk! I love the way they are packaged and coordinated with the bright colors. Be sure to come check out our other Teacher Appreciation Ideas at Anders Ruff and also our free printables! MAUREEN ANDERS is the co-founder and creative director of Anders Ruff Custom Designs, the ”go to” shop for unique and stylish printable invitations, decor and party accessories. Anders Ruff equips the modern hostess with the beautiful details needed to make their events memorable. They also offer inspiration for the entire party planning process via their daily blog. Anders Ruff loves pulling together themed party ideas on their Pinterest boards. Be sure to keep up with their latest projects and sales at their facebook and twitter page. Shop all of their holiday and party themes here.